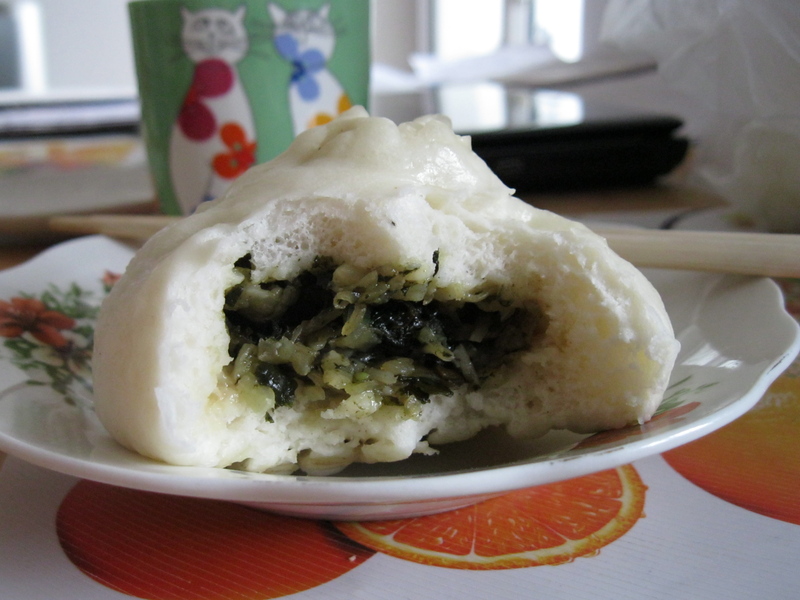 I just finished eating a hearty breakfast of baozi (包子), and decided that it was time that I write a post about the food I’ve been eating so far in China. Baozi are steamed buns with a variety of savory fillings. Sometimes it’s a surprise what you’ll get inside, but I have yet to be disappointed. The most common seem to be beef and pork, but I’ve also have ones filled with various green vegetables, sour cabbage, or chicken. It seems like each baozi maker has their own special recipe. This morning I bought two big baozi (1 kuai each) from a stand at the little fruit/veggie market outside my apartment, and they were filled with cooked seaweed and onions. It might sound a little strange, but it definitely hit the spot! 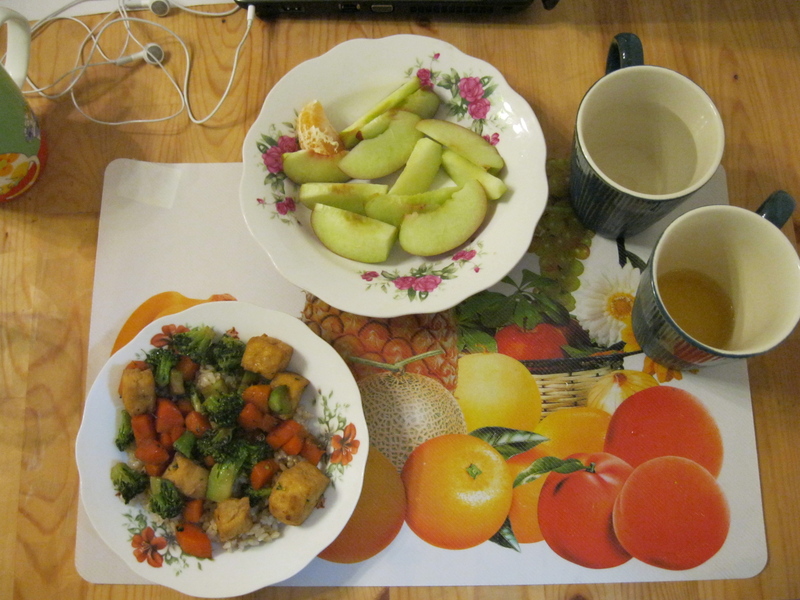 They are a pretty common breakfast food, so in the morning you can get them fresh from the steamer. The dough is warm, fluffy, and slightly chewy. It really is happiness in bun form. Yum! I might eventually get sick of them, but right now I can’t seem to get enough. Oatmeal was one of my favorite breakfast foods in the US, so I was really excited to find some here. However, the oats that I bought here were definitely not Quaker Instant Oatmeal. They’re actually more like livestock feed– thick, starchy and not very appetizing. 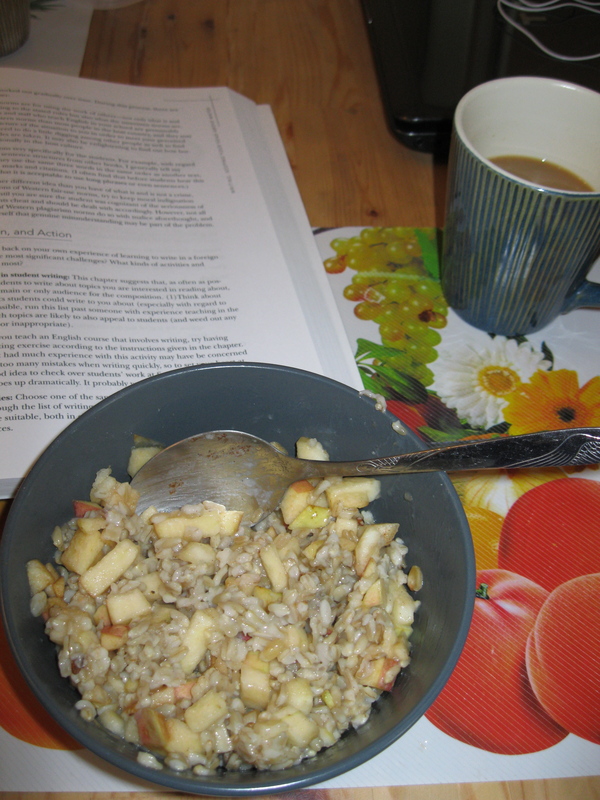 But I got creative and cooked the oatmeal one morning, then added some sliced apples, sugar, cinnamon, and voila– awesome breakfast! The selection of fresh fruits here is awesome. Right now our little market is full of peaches, nectarines, apples, bananas, pears, and watermelons. The other day I saw a woman selling mini watermelons, about two pounds each, and asked her if they were the same as the bigger ones. 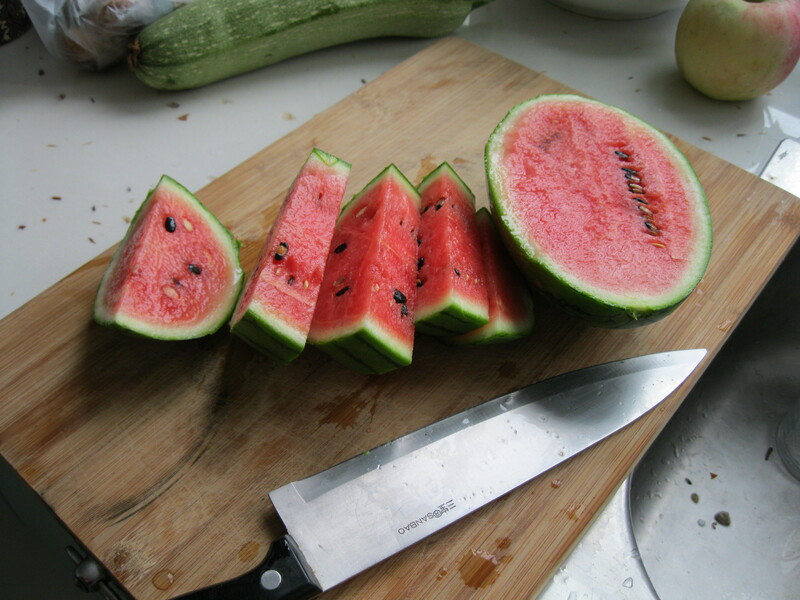 She said yes, so I took it home, cut it up, and sure enough, it was exactly like a regular watermelon…except mini! Margaret and I both enjoy cooking (and eating vegetables), so several nights a week we make stir-fries using whatever veggies we bought at the market that morning. It’s been fun to get creative and diversify our stir-fry repertoire by adding tofu (also fresh from the market), cashews or scrambled eggs. As you may or may not know, I am a huge fan of “boba” or the tapioca starch balls that are commonly put in milk tea. 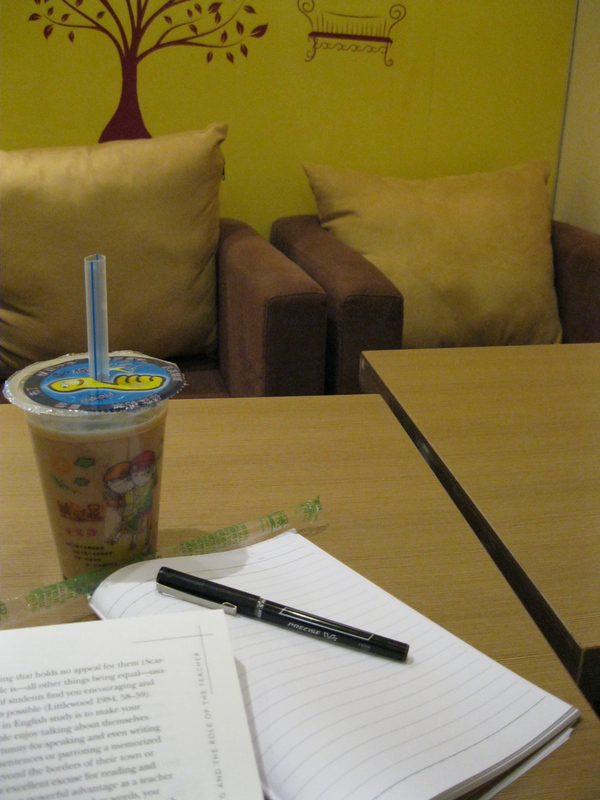 So yesterday I decided to check out a new little coffee shop-esque place near the apartment and investigate their Bubble Tea or Pearl Milk Tea options (read more about the drink here). The tea was way too sweet for my liking, but I love the boba. You drink them up through a fat straw, and they are a slimy, chewy party in your mouth! Last night I went out with a group of friends to a Korean barbecue restaurant near the university. At each table there is a recessed pot that holds hot coals, with a mesh grill on top. You order whatever different kinds of meat you’d like to eat, and then the waiter helps you grill it right at your table. 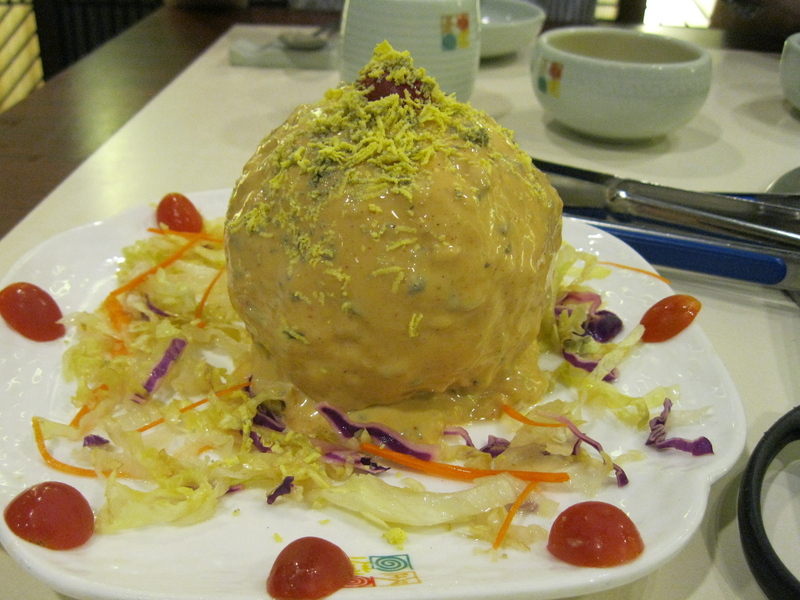 (If you haven’t gathered already, my vegetarian lifestyle hasn’t held up in China for a number of reasons…) Seeing the meat grill was fun, but the highlight of the meal was a massive mashed potato ball covered in Thousand Island dressing. It was served chilled, so tasted a lot like a potato salad. I couldn’t resist snapping a picture. Whaaat? Your vegetarian lifestyle in danger? Bubble tea is yummy, but that potato thing sounds gross! If you like Thai Iced Tea (chaa yen) here is the recipe. I’ve been making it recently to bring me back to Thailand. Brew a cup of black tea. Stir in some sweet condensed milk to taste. (changes it to that orangy color). Chill or add ice, and serve. Throw in some boba too!